In conjunction with our DCASE 2018 workshop paper, ‘An extensible cluster-graph taxonomy for open set computational sound scene analysis’ we share here our first initialisation of the taxonomy as saved in python pickle files. Some isolated clusters include; en.pckl (environments/scenes from DCASE challenges), ev.pckl (events), and c.pckl (contexts). All files in version one are based upon the label sets provided with DCASE challenges from 2013 until 2018. Each pickle contains a list of nodes (1d array of strings), and a list of edges (1d array of string tuples) named ‘nodes’ and ‘edges’ respectively. 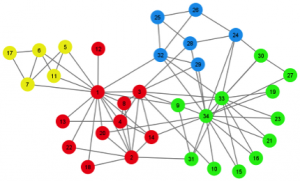 It also contains a single string called ‘desc’ to describe the graph. In future releases where edges might be weighted, this is an integer added to each tuple list of edges. If you use this please cite the paper; ‘Helen L Bear and Emmanouil Benetos, An extensible cluster-graph taxonomy for open set computational sound scene analysis. DCASE workshop 2018’ and do update us with your extensions, clusters, & associated references for us to share on here with the community.